Marco Rubio’s hypocrisy: Why do Republicans love background checks for immigrants but not for gun buyers? Why do Republicans love background checks for immigrants but not for gun buyers? 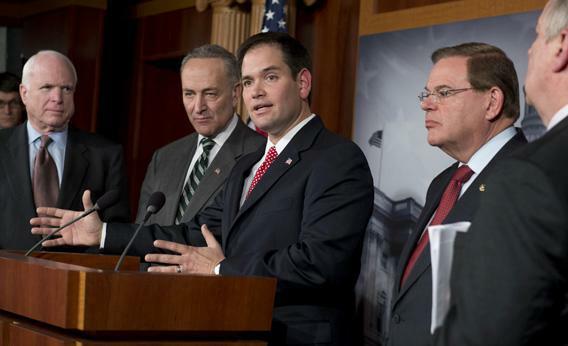 Sen. Marco Rubio, R-Fla., speaks at a press conference on immigration reform, Jan. 28, 2013. Mandatory background checks are a terrible idea. They burden law-abiding citizens and don’t catch criminals. The databases they rely on are riddled with errors. We don’t even prosecute people who flunk the checks. That’s why Republicans are against imposing such checks on gun buyers. On the other hand, if you want to catch illegal immigrants, forget everything I just said. Running everybody through a database is a terrific idea. Republicans are all for it. While Rubio was busy making this case, a different law enforcement problem exploded. In Arizona, Colorado, and Connecticut, three deranged gunmen murdered dozens of children and adults. The massacres were unrelated, but they provoked a national debate over how to prevent future killings. Some senators proposed legislation to require background checks for anyone buying a firearm. Under the bill, buyers’ names would be run through a database of people convicted of felonies or certified by a judge as dangerously mentally ill.
You don’t need to be a native English speaker to recognize the hypocrisy. In the age-old dilemma between liberty and law enforcement, Rubio switches sides depending on the issue. He believes passionately that laws designed to catch lawbreakers don’t work, that inconveniences to law-abiding citizens are intolerable, and that government databases are unacceptably dangerous—but only if you’re buying a gun. I don’t mean to pick on Rubio. His selective, alternating appeals to liberty, cynicism, and public order hardly distinguish him. The current Senate bill to deploy E-Verify against illegal immigrants has 11 sponsors and co-sponsors. All but two of these senators voted last week to block debate on background checks for gun purchases. And these nine are just the tip of the iceberg. So let’s drop the pretense. Most politicians standing in the way of background checks for firearms don’t really believe in freedom or limited government. They simply care more about controlling immigration than they do about controlling guns.